We have noticed a big change in our Antique & Vintage Lighting business in the last 5 years. In the previous 30 years the tendency was for collectors and restorers to make their houses look like they did 100 years before. They would collect things for their homes that made them look like they did in the period. This approach still exists but there is a new approach that is less interested in historic preservation and more interested in putting the “ personal stamp “ of the individual owner on the interior. This new customer still buys Antique Lighting but is more interested in something unique and unusual to complete their rooms. Because of these recent developments, we as a business have had to reinvent ourselves and try to find the Antique & Vintage Lights that are less available. The creation of the late Victorian Gas Period in respect to Antique Lighting Fixtures, has a kind of dance between structure, function, utility and design. The function and utility is how the technology is being delivered. The design and structure is how the manufacturer is choosing to house this delivery. This brings up the idea of beauty, both as how it was conceived of back during the time it was manufactured, and now, how it is appreciated aesthetically more than 100 years later. The reason why we are bringing this up is not because we want to write a philosophical treatise but because these ideas are useful tools, for you the client, to determine what is unique and unusual when it comes to the things we are offering. We think probably everyone who lives in an old house wants that fact reflected somehow in what details they use to decorate. This integration of details has changed the design of the Home Interior which creates a new approach to how Antique & Vintage lighting design is reflected. It has become obvious that the items that are being integrated into these new environments require some custom application to make them work. 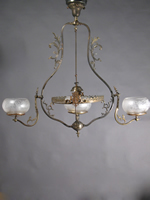 We really welcome the chance to have the antique lighting out of the collection we have acquired, to work in these new environments, and fully realize that the pieces don’t necessarily work as they were when manufactured. As an example, they may have to be lengthened to work on a ceiling that was vaulted. Adapting our Antique Lighting to fit in current day allows us to use skills we have developed over the last 35 years and work with the customers to make the pieces work without changing the essential character of the fixtures. Let us get back to the dance between structure and function and what we, as a business, look for. If you look at a Gas Arm as another example, let’s ask, how did the designer solve this problem s/he was presented with in delivering the technology. The arm is about 10 inches long. Because of tastes of the times people were perceptually expecting some decoration to be incorporated in the arm that satisfied their expectations about something that approached the question of beauty. When we look at those 10 inches over 100 years later we are asking the question, did they accomplish the manufacture of this arm in an unusual or unique way. All things are relative but these are the basic ways I decide what I want to inventory and work on. We really only sell unusual things because that is how the market has changed. Let’s talk about Leaded Glass as an example of the unusual. In a way the process used to create leaded glass light fixtures has remained in the individual’s capacity to control the last 100 years. When you think of these complicated ornate chandeliers that were created in the Victorian era, they required, the more complicated they were, the use of machines, assembly line and other industrial processes. They can be appreciated for what they were, and the expression that formulated them in time, can be isolated and studied as something unique that eventually became the technology that we appreciate today. But when you think of leaded glass, one person could spend a day or a week working on a creation that technically required the use of a kiln, flat sheets of slag glass and copper foil. For us, this seems very similar to an oil painter or a sculptor with their individual palettes of possibilities. That’s why when I look at leaded glass, I look for the individuals hand as would look and be delighted by the inconsistencies in a hand made antique oriental rug. All of what has been said constitutes how we differentiate ourselves so we are creating “value” for people that is affordable and how do we bring our skills to bear on their “problems” so we can keep doing what we like to do. Secondly, how can we get paid for this so we can keep doing it. We really like to work on fixtures that we have chosen for the reasons that we think are desirable. That is what we want to keep doing. Also, there can be an excitement on the part of the customer when our skills are used to integrate something special into their living space especially when they deem it beautiful and enjoy this beauty every day. For us, this represents a new “frontier” that we are seeing more and more, and represents “inspired work” that we can be enthusiastic about. Ultimately our goal is to keep on doing what we like to do and transfer our knowledge and experience to our customer for their own “ personal stamp “.